Sarah Dessen’s books all have the same general framework, a troubled girl meets up with a troubled boy (usually over the summer) and their friendship blossoms into romance and helps the both of them overcome their troubles. The Moon and More is a bit different. Eighteen-year-old Emaline has a good family, good friends, a happy relationship with long time boyfriend Luke, and is generally satisfied with her life in the beach town Colby. Things are not perfect, she has a rocky relationship with her estranged birth father and she is not able to attend the ivy-league college she has been accepted to because of money, but they are good enough. Enter Theo, a young man in town assisting a filmmaker shooting a documentary about a local artist. Theo’s presence adds the trouble and murkiness to Emaline’s satisfied life and leads her to question everything she once believed. 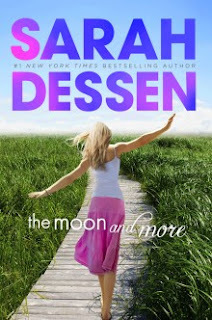 Dessen continues to create characters and stories that readers love. She is a gifted writer The Moon and More is a welcome change to her standard formula, while remaining true to her overall theme of young adults finding themselves. Close readers will appreciate the cameos from previous novels. Dessen fans will not be disappointed with this latest offering.